Donald Trump’s year continues to implode, beautifully: both ESPN and the Professional Golfers’ Association of America have decided not to hold their tournaments on Trump-owned golf courses. Is there a more elderly and blindingly white community than golf, one that might still support Trump? No? That’s the oldest, whitest one? Dang. We decided it was appropriate to change the venue, and are grateful for the opportunity to stage the event at Pelican Hill on short notice. Diversity and inclusion are core values at ESPN and our decision also supports that commitment. 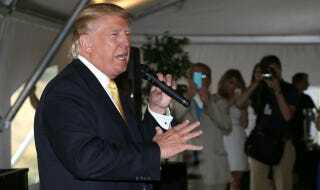 The PGA of America met with Donald J. Trump yesterday and the parties mutually agreed that it is in the best interest of all not to conduct the 2015 PGA Grand Slam of Golf at Trump National — Los Angeles. The PGA of America is in the process of exploring options, including a venue for its annual PGA Junior League Golf Championship, and will comment further at the appropriate time. In related news, Donald Trump is still pretending like he’s going to be the President of the United States.